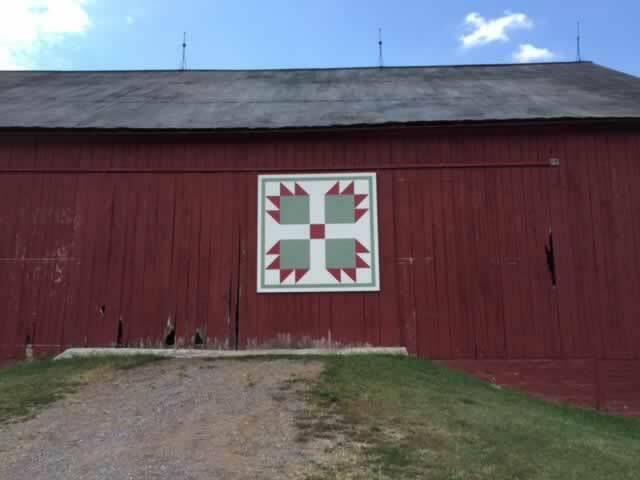 This bear paw quilt patch that hangs on the 1800’s barn is an updated recreation of an original quilt completed by Grandmother, Clara Flook, her sister, and mother in the late 1800’s. The quilt was on display during the Fulton County Fall Folk Festival in McConnellsburg. Bears have been observed in this part of Fulton County. The bear claw patch represents the tenacity that bears have to provide food, and shelter for them and their cubs. This assures their existence. The same applies for the family farms that thrive throughout Fulton County. In order for their survival the farmer of today needs tenacity along with many other skills and virtues. Many farm families work for the common good providing a wholesome, natural food source for their families and the consumer. Enjoy your quilt patch tour. Larry and Bonnie Flook like many others had no problem wanting to support the Fulton County Historical Society with the society's sponsored quilt patch trail. The patch was a welcome addition to their serene farmstead that lies below Timber Ridge in the southern part of Fulton County which is about 15 minutes from Hancock Md. Having A Quilt patch on the early 1800's barn would add an extra touch of country flair. When choosing the patch that would grace their barn they wanted something with special meaning. Black bears have been seen in the area. Bears need tenacity to survive in their changing habitat. Farmers also need tenacity and many other virtues to assure the continuation of their farms in securing their way of life. Larry's grandmother Clara Flook was a well know quilter in the Myersville Md area. She started quilting at a very young age with the tutelage of her mother Susan Grossnickle Leatherman. Clara's talent flourished as did her quilts. Her children, grandchildren, and great grandchildren were blessed with quilts that she pieced and quilted. Now her great-great grandchildren are aware of her legacy. Several of her quilts were used as fund raisers for the Myersville United Methodist Church. Larry & Bonnie's choice was the bear claw a late 1800's quilt . This quilt was the inspiration for the quilt patch that hangs on their barn. The quilt had been pieced and quilted by Susan Grossnickle Leatherman, Clara's mother. Clara also assisted with this quilt along with her sister, Nannie. In young Clara's life girls were taught early the virtues of the needle and the stove. Grandmother also had her academic schooling, which was not common in those times. Joe Shearer, a friend painted the quilt patch that now hangs on the barn for the Flook Family. Larry and Bonnie kept the same sage green color and the bear claw design. The patch needed some extra depth so the added the barn red paint to the claw. Holding the quit is Larry Flook Grandson of Clara Flook, Jason Flook great grandson. Amelia Flook is the sixth generation to enjoy the heritage of her great great grandmother's talent. Amelia is the daughter of Nathan and Sarah-Jane Flook of Middletown Maryland. The calico sage green quilt material shows its age yet the tiny even stitching is still very much intact. The art of the needle has continued in Amelia Rose. Amelia has her own sewing machine and has given her creative animal pillows as gifts. Amelia guided by her mother enjoys designing and sewing. The legacy of Clara Flook and her mother Susan continues on through the generations. Our family is a melting pot of history with a future of blessings to meet the challenges.